Main idea: When we have BEE attitudes instead of ME attitudes, people will sometimes dislike us and treat us poorly, but that persecution shows that we are Christians and are going to Heaven. This is lesson 9 of 9 in this series. Use these links to find the whole series. Take time to meditate on this week’s Scripture and think about your own life. Chances are pretty slim that any of us will face life-threatening persecution. But will we stand with and pray for those who do? Will we choose to stand firm in our faith when we face any form of persecution in our own lives? Think about ways you may face persecution in your own life and resolve now how you will react to these potential situations. It’s like having an emergency plan if your house is on fire. When the fires of persecution come, will you be ready to endure them for the sake of Christ? Also spend time in prayer for those who are persecuted and for those who persecute. Chain tag helps us remember those who are in chains for their faith. Clear an open space. One child is “it.” When “it” tags someone, that person joins hands with the first “it” and runs with them. Now the child who was tagged becomes it. While holding hands (or putting their hand on the first person’s shoulder,) the second child in the line, now “it,” must tag a third person. The third child links up with the second and becomes the new it. Players must remain in contact with one another as they run and try to tag other kids. The game ends when only one person is left untagged. “Blessed are those who are persecuted because of righteousness, for theirs is the kingdom of heaven.” Today’s Beatitude is a little different from the other Beatitudes. You notice that it is the only one that Jesus explains in a little more detail. All the Beatitudes are one sentence each. Except this one. Verse ten gives us the one sentence Beatitude for today, but in verses 11-12, Jesus explains this last Beatitude in a little more depth. This tells us that today’s lesson is of course an important one, and one that may be a little tougher than the others have been. I don’t think the concept of being persecuted for righteousness’ sake is hard to understand, but actually BEING persecuted because you do the right thing can be very, very difficult. So Jesus tells us the last Beatitude, and then tells it to us again using slightly different words, so this Beatitude will really stick in our minds. These are all great things we can do to follow Jesus boldly. Sometimes when we do these things, people will tease us or call us weird. And that’s okay. It’s okay to face persecution when you are doing the right things. That’s what Jesus is telling us in this last Beatitude. When we are teased for boldly following him, we get the kingdom of Heaven. When you think about it, it makes perfect sense that the blessing, the reward for having the BEE attitude of facing persecution is receiving the kingdom of heaven. We face persecution when we follow Jesus. When we follow Jesus, we get to go to heaven. So when we face persecution, we get to go to heaven because persecution is a sign we follow Jesus. Persecution happens to Christians all over the world. Most of us won’t ever face severe persecution. We may lose friends, be teased or bullied, or lose our jobs or get in trouble with our teachers. In some places in the world though, it is actually illegal to be a Christian or to even own a Bible. There are followers of Jesus in the world who are arrested, beat, have their homes or churches destroyed, or are even murdered just because they love Jesus. Let that sink in for a minute. People are killed just because they love Jesus and want other people to love Jesus too. We may see that as a terrible thing, but Jesus says we are BLESSED when we are persecuted. We receive God’s favor, we can be happy when people tease us, beat us up, steal from us, destroy our stuff, kick us out of school or sports or fire us, call us names, and even kill us because we love Jesus. This is another one of those Beatitudes that doesn’t seem like a blessing. How can persecution be a good thing? Well, it helps when we have a right perspective on things. If we are being bullied, beaten and burned at the stake for no good reason, then this would be really sad! But as Christians, we see things differently. We don’t see the pain of persecution. We see the reward of Heaven. The thing is, Heaven is SO GREAT that even being stoned to death because we love God is a blessing! We can only understand a little glimpse of what Heaven will be like. It’s like seeing your Christmas presents all perfectly wrapped in shiny paper with bows on top. You don’t know exactly what your present will be, but you know it will be awesome. Heaven will be awesome. Here’s a small glimpse of Heaven, from Revelation 21:3-4. “And I heard a loud voice from the throne saying, ‘Look! God’s dwelling place is now among the people, and he will dwell with them. They will be his people, and God himself will be with them and be their God. ‘He will wipe every tear from their eyes. There will be no more death’ or mourning or crying or pain, for the old order of things has passed away.’” Heaven is a place where we get to be happy and with God all the time forever. Nothing could be better than that, and nothing that happens to us in this life can be so bad that it would make Heaven not worth it. No matter what we go through in this life, no matter how bad, we have Heaven to look forward to. That being said, persecution is still a serious thing. Christians are suffering intense persecution all over the world right now. And the Bible tells us what we can do about that. Let’s have a sword drill to see what God expects us to do in the face of persecution. Take all fingers and bookmarks out of your Bibles and hold them above your heads. When I say go, look up Hebrews 13:3. Go! (Read, or have a student read Hebrews 13:3.) 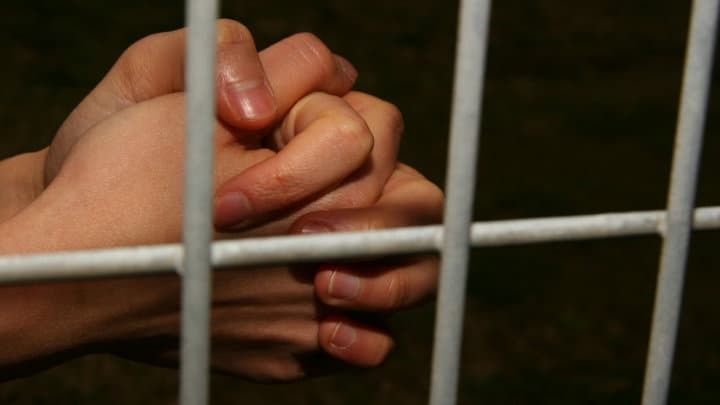 “Continue to remember those in prison as if you were together with them in prison, and those who are mistreated as if you yourselves were suffering.” When this verse says remember, it doesn’t just mean spare them a passing thought every now and then. When we remember those who are suffering because of their faith, we should pray for them. We should pray for those who are being persecuted. We should also pray for those who persecute us. It says so right in the Bible. Let’s do one more sword drill to see where it says this. Take all fingers and bookmarks out of your Bibles and hold them above your heads. When I say go, look up Matthew 5:44. Go! (Read, or have a student read Matthew 5:44.) “But I tell you, love your enemies and pray for those who persecute you.” Jesus wants us to pray for those who persecute us. This really is at the heart of what it means to be a Christian. Followers of Jesus love God first, and love others. This is what God calls us to do. He doesn’t tell us to love only the people we like or get along with. We are to love everyone, including the people who persecute and mistreat us. 2 Corinthians 4:17-18 may make it a little easier for us to pray for those who persecute us. It says, “For our light and momentary troubles are achieving for us an eternal glory that far outweighs them all. So we fix our eyes not on what is seen, but on what is unseen, since what is seen is temporary, but what is unseen is eternal.” When we stay focused on our reward, on Heaven, it makes it easier to pray for people who are mean to us. We remember that they are in need of Jesus. The Beatitudes have taught us how to have an attitude that focuses on others instead of ourselves. So when we are being persecuted for being righteous, we can remember to pray for our persecutors because we have learned how to have BEE attitudes. We are poor in spirit and recognize our need for a savior. We mourn over our sins and meekly submit to the Lord. When we do these things, we begin to hunger and thirst for God’s righteousness. God gives us the kingdom of heaven, he comforts us and tells us we’ll inherit the earth, and he fills us with his righteousness. After all the brokenness, we begin to grow in our ability to love others. We become merciful and pure in heart and peacemakers. When we begin to do those things, we will be persecuted. And that’s okay, because we gain the kingdom of heaven! If there is one thing I want you all to remember from the past two months in the Beatitudes, it’s this: God blesses us when we follow him. God gives us what we need, gives us his favor, when we follow him. He loves us and wants us to have a life full of him. The Beattitudes are what our attitudes are when we follow Jesus. So let’s follow Jesus with our BEE attitudes instead of our ME attitudes! Students will make a paper chain to remind themselves of those who are in chains for their faith. You can either have the kids make standard paper chains by cutting out strips of paper and gluing them into linked circles. Or you can avoid using glue altogether by making unique paper chains using the provided template. This paper chain is reminiscent of handcuffs. To make it, print out the template onto cardstock or print it onto regular paper and glue it onto light cardboard, like a cereal box, to make a sturdy shape to trace. Cut out each hook shaped stencil. Each child will need one. For each link, fold a piece of paper in half short side to short side (hamburger style,) and then in half again the other direction. Orient the paper so the part with two creases in it is closest to you, (to the edge of the table) and the part with one crease in it is to your left. Place the stencil on top so that the straight part lines up the left side of the paper. (The part with one crease in it.) Trace the stencil, then cut out the shape. Unfold it. You should have what looks like a barbell, or a line with a circle on each end. Repeat the folding and tracing and cutting again. Unfold this one so it looks like a lollipop. Now take the first link and fold it in half so it is long and skinny, so it looks like two semicircles with a line in between. Now that it is long and skinny, you can loop it through the hole in the other link. Make sure it goes through both circles. Once you get the long and skinny link threaded halfway through the other link, unfold it and fold in in half in the other direction, so it looks like the other link. (Like a lollipop.) They now hold together. Continue adding links until your chain is as long as you want it. I suggest using yellow and black or purple paper to make it look like a bee to help remember the BEE attitudes. Tony Kummer (Editor) reviewed & updated this page on : February 14, 2019 at 8:01 pm. All our content is peer reviewed by our readers, simply leave a comment on any post suggest an update.